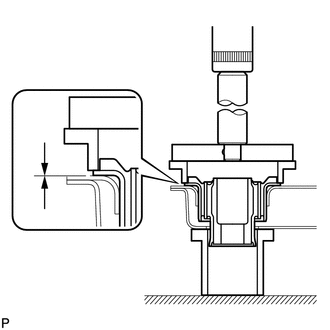 (a) Install the stud bolt. (a) Install the hole plugs to the rear suspension member sub-assembly. There are 2 sizes of the hole plugs. 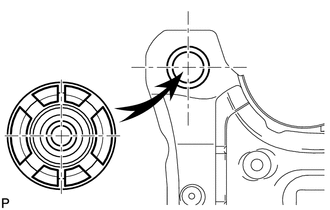 (a) Temporarily install a new rear suspension member body mounting front cushion LH to the position shown in the illustration. (b) Using SST and a press, install the rear suspension member body mounting front cushion LH to the rear suspension member sub-assembly. Slowly press in the mounting cushion. 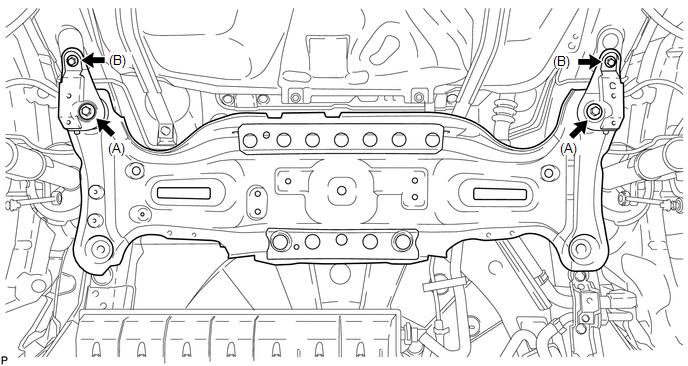 (c) While observing from the side, press in the rear suspension member body mounting front cushion LH until there is no clearance between the rear suspension member body mounting front cushion LH and the rear suspension member sub-assembly as shown in the illustration. Do not press the rear suspension member excessively, or it will easily deform. 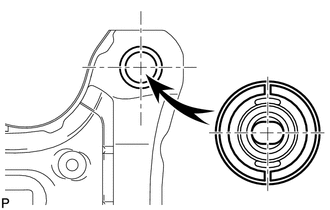 (a) Temporarily install a new rear suspension member body mounting front cushion RH to the position shown in the illustration. (b) Using SST and a press, install the rear suspension member body mounting front cushion RH to the rear suspension member sub-assembly. 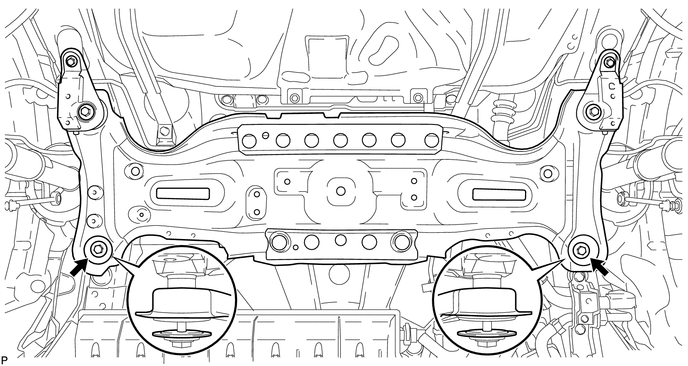 (c) While observing from the side, press in the rear suspension member body mounting front cushion RH until there is no clearance between the rear suspension member body mounting front cushion RH and the rear suspension member sub-assembly as shown in the illustration. 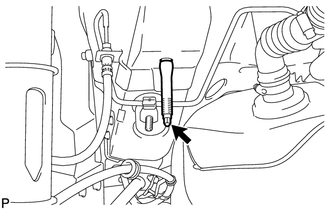 (a) Temporarily install a new rear suspension member body mounting rear cushion (LH side) to the position shown in the illustration. (b) Using SST and a press, install the rear suspension member body mounting rear cushion (LH side) to the rear suspension member sub-assembly. 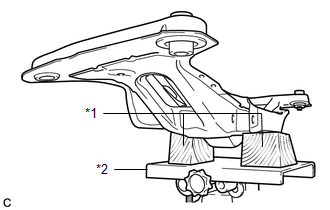 (c) While observing from the side, press in the rear suspension member body mounting rear cushion (LH side) until there is no clearance between the rear suspension member body mounting rear cushion (LH side) and the rear suspension member sub-assembly as shown in the illustration. 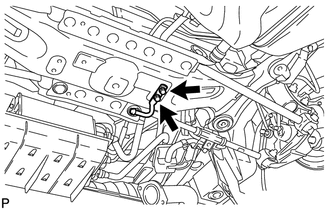 (a) Support the rear suspension member using a jack and 2 wooden blocks as shown in the illustration. Make sure to secure the rear suspension member to prevent it from dropping. (c) Install the rear suspension member and rear lower suspension member stopper LH and rear lower suspension member stopper RH with the 4 nuts. 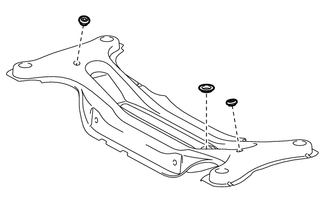 (d) Install the rear suspension member and rear lower suspension member stoppers with the 2 bolts. 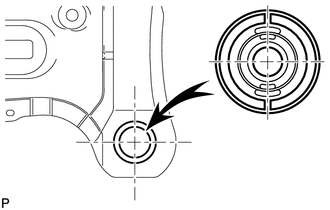 Be sure to install the rear suspension member with the rear lower suspension member stoppers in the correct direction shown in the illustration. (a) Install the lower No. 1 exhaust pipe support bracket with the 2 bolts.